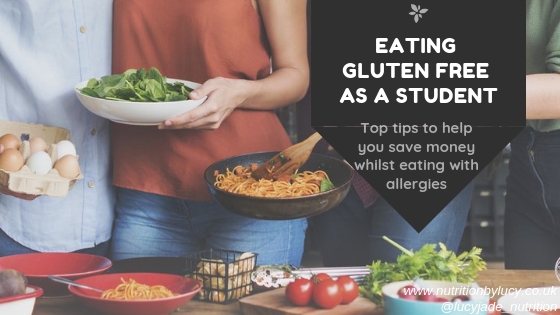 But if you are gluten free this poses a difficulty as you already know how pricey the alternative are, and how there is very rarely an option for you to eat after a night out, unless you want a soggy salad and some risky chips. Gourmet meals are not on the menu for students either but for those that want to eat healthier but still have the luxury of convenience, scroll down! 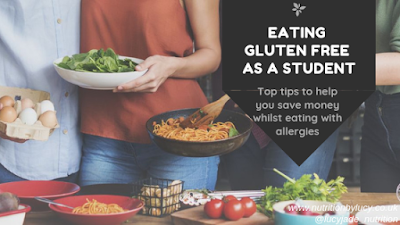 I've included a tip about milk alternatives too (I know a lot of people drink them) which is something I have only recently started doing and has really helped with costs! If you have any more tips, leave them in the comments, or send them to me and I will share them! Supermarkets try to play on the anxieties you can have when you have allergies and offer you 'safe' options like free from tomato ketchup. However if you simply check the ingredients on the 'normal' bottle of ketchup, then you will see that they are exactly the same ingredients but for half the price. So it is always worth checking! Go later in the evening and check the reduced foods, it's always worth the try! Sometimes its worth asking the staff what times they commonly start reducing foods so you know when its best to pop in. In Tesco it is always worth checking the reduced bakery section as this is where the reduced bread is sometimes kept. This isn't just a way to save money, this is also a really good way to make sure you have nutritious and healthy meals ready to grab and go. If you batch cook something like a chilli or a stew, when you have a long day at uni you won't be grabbing a takeaway. This can be especially useful if you utilise the closing hours of the supermarkets when they half the price of the food. Grab it all, throw it in a pot or in the oven, and just like that you have meals for the rest of the week that you can take out the freezer whenever you need. This also is a great way to keep vegetables. One person cannot always necessarily eating a whole bag of spinach or a whole packet of mushrooms in one week so putting them in tuppawear container chopped up means you have easy to grab food, fresh and ready to pop into a stir fry. It might be a bit of a pain at first, but shopping around for different items such as bread, milk, tinned foods or vegetables. For example, if you have a market near you, the vegetables are usually a lot cheaper there so might be worth you stocking up. And you can always use the freezer trick. Shops sell big bags of bananas really cheap as soon as the skin goes a little brown. Take them home, chop them up and pop them in the freezer, great to add to smoothies or whizz up with some milk and peanut butter to make a 'ice cream'.